NATO facebook friends come to chicago and i offer a few pointers on how to get along with native midwesterners! 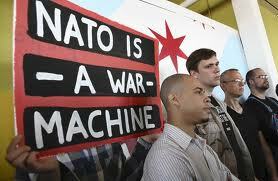 chicago plays host to the NATO conference this weekend. workplaces and schools have been shut down, dire warnings issued about protesters and traffic jams and delays at the airport and the lines at starbucks. buses have been dropping off protesters. o’hare is clogged with NATO dudes and galpals. i am quite happy i’ll get to see some of my facebook friends who are ambassadors, and i write this blog as a way of giving them some tips on american culture, particularly midwest culture, that might not have been brought to their attention by their briefers. as an ambassador, you might see some people with signs that might not seem to be welcoming. rest assured, midwesterners are a friendly sort. and they make good use of irony. if someone says in conversation or shouts to you that you are a warmonger, a friendly smile and a wave is your best response! some pedestrians may wear green robin hood masks–these people are asking for a redistributive tax system to help those countries and peoples who are poor. this is not a good time to complain about the quality of champagne and foie gras you were served the evening before. some pedestrians may have been offered bracelets that connect together, most times at the wearer’s backs. feel free to ask a police officer if you can have two of those souvenir bracelets. if he hesitates, it is only because he expects you to do the midwestern handshake–which is to close your right hand in a fist and smash his nose. you’ll get your bracelet right away! although you won’t be able to join your new friends in their city provided accommodations. . .
an interesting note: these people could theoretically be arrested for disturbing the peace and whatnot. as a nato ambassador, you cannot be arrested, detained or held by police unless a waiver is obtained from your home country. diplomatic immunity is da bomb! lastly, two words about, ahem, personal interactions. a common greeting should you meet a male for the first time is “yo mama” followed by a compliment. for instance, “yo mama is so fat that when the Lord told her there was no room for her in heaven, the devil said there was no room for her in hell!” the point of the compliment is that the other person’s mother is such a good cook and has an abundance of food so that she can develop into a robust and traditionally built lady. trust me, any gentleman you say that to is going to immediately call you brother–you might even get a midwestern handshake! and if you meet a woman in the course of your day? grab your crotch, and announce loudly “i want me some of that!” women love that sort of thing! 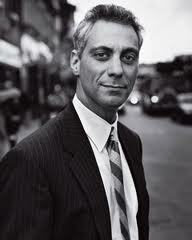 mayor emanuel really needs this weekend to go well! everything has been arranged for your comfort and safety as if he were conrad hilton and arnold schwarzenegger in one! 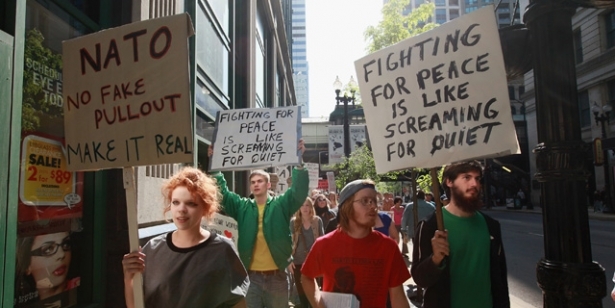 as for the comfort and safety of the folks protesting NATO and the status quo, uh, well, not so much!